A new urgent care facility has opened in the burgeoning neighborhood of Sioux Falls, South Dakota. Sioux Falls Specialty Hospital Urgent Care is a 27,500-square-foot clinic located at the northeast corner of 85th Street and Minnesota Avenue. The $6 million facility, completed by Fiegen Construction, provides comprehensive care for patients with everything from sore throats to sprained ankles. The urgent care center is physician owned and operated, overseen by Dr. Blake Curd and Jon Crow, both affiliated with Sioux Falls Specialty Hospital. The two-story, state-of-the-art facility was designed to replicate the clean and technologically-advanced atmosphere of the renowned Apple retail stores. 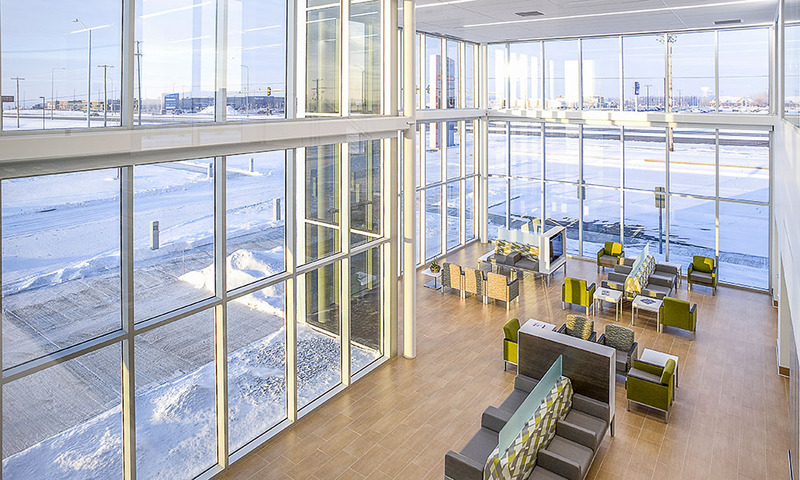 “We’ve always thought of ourselves at the forefront of innovation and putting patients at the center of what we do, so we wanted to design a building that was similar,” said Jon Crow, Sioux Falls Urgent Care Director of Operations. 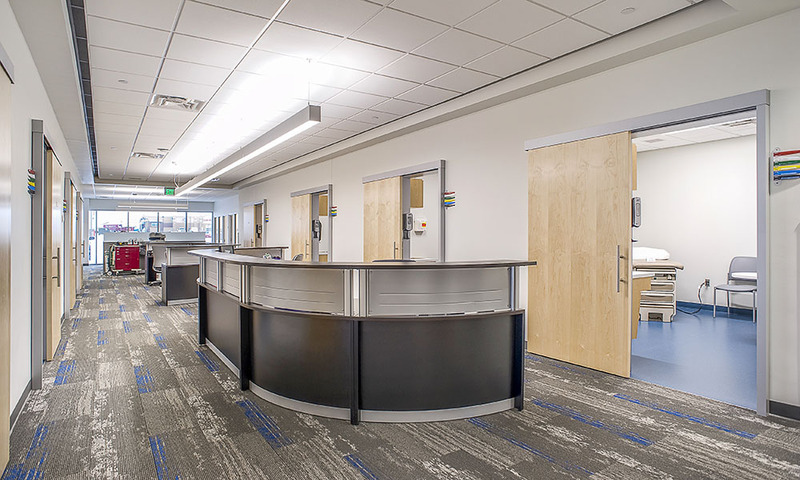 In addition to open atriums and spacious waiting areas, acoustical aluminum sliding barn doors were installed outside exam and office rooms. The exterior of the clinic was also constructed with structural steel, metal panels and large glass windows. “I’m excited for Sioux Falls Urgent Care to bring the same five-star treatment to an urgent care facility that the region has come to expect from Sioux Falls Specialty Hospital,” said Dr. Curd. “It’s about time for better healthcare – and less waiting for the patient to be treated. With no appointment necessary and most insurance accepted, we know this is going to be the finest urgent care in the region.” The new clinic is also home to WorkFORCE Occupational Health and Medical Services, offering complete workers’ compensation injury and illness examinations, drug and alcohol screening services, work physicals and fitness tests, and OSHA-required health evaluations. Despite challenges associated with performing construction at a busy intersection with limited access, the Fiegen Construction team completed the clinic in just 11 months. The existing site’s soil also consisted of highly unstable organic materials. Commonly referred to as peat, this organic material has historically been a problem in the construction industry. The material’s low strength and high rate of compressibility make it nearly impossible to properly support a structure. Our team removed the organic material and reinforced the site with geotextile fabric and a crushed recycled concrete base. The project was overseen by Project Superintendent Jayd Borman and Project Manager Terry Boomsma. Fiegen Construction also partnered with JLG Architects, JSA Engineers and Land Surveyors, Inc., West Plains Engineering, Inc., and Structural Engineering Associates, Inc.
Dr. Blake Curd hopes to open additional urgent care clinics in the future. “It would not surprise me if this is not the only [urgent care facility],” Dr. Curd states. “I can see us finding another prime location and expanding to other areas in the city.” We’re excited to join Sioux Falls Specialty Hospital Urgent Care in their continued goal to provide top-notch care to the region. “Fiegen Construction is pleased to be the Sioux Falls Specialty Hospital contractor and will continue to strive to provide the best value and schedule adherence with our long-standing partner,” says Jeff Fiegen, President.